The Le Lambert features a durable 19mm precision-ground slate bed that has been specially built to under-pin the top rail, therefore providing you with an exceptionally smooth surface. What's more the sturdy steel legs contain individual leg levellers that ensure the slate bed remains perfectly level. The Lambert is certainly one of the most customisable tables on the market and can be styled to your exact needs. 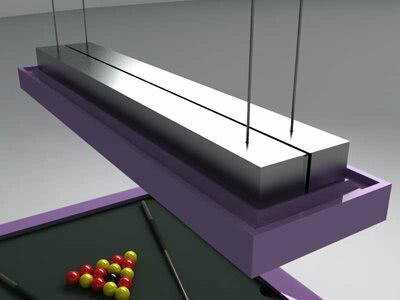 There are a wide variety of table finishes, cloth colours and sizes available, as well as specialist options such as LED lighting, overhead lamps and dining table tops. 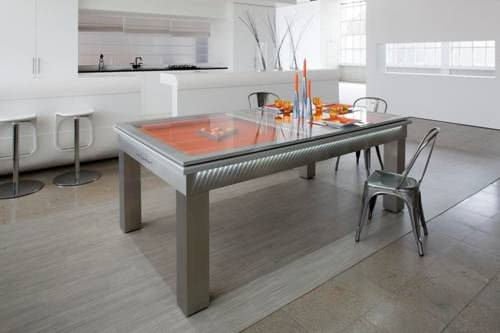 A multi-functional table that is ideal for the home, games room, offices and common rooms. It is also suitable for players of all levels of experience. 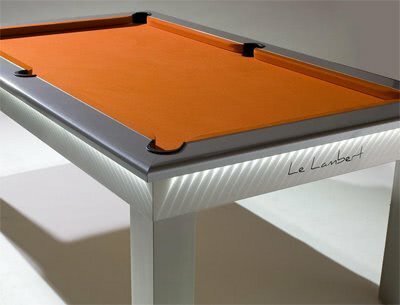 The Le Lambert has a genuine stainless steel metallic finish on the cabinet and legs and a wide choice of colours for the top rail and cabinet panels. The Le Lambert can be finished with any commercial laminate, and as such, is available in a variety of wood grains, matte colours & metallic colours. We list samples below, but please call to discuss any colours or finishes that aren't listed. 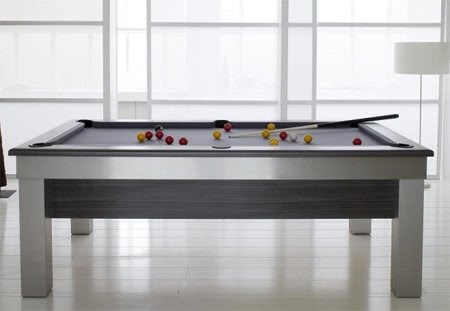 The Billard Toulet Le Lambert is fitted with high quality Hainsworth Elite-Pro cloth, the professional's choice for American pool. The worsted cloth provides excellent ball speed and long lasting play.